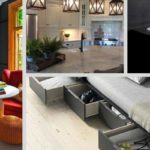 Welcome to our gallery featuring 40 unique designs of entryways (foyers) in luxury houses for finding decor inspiration ideas. 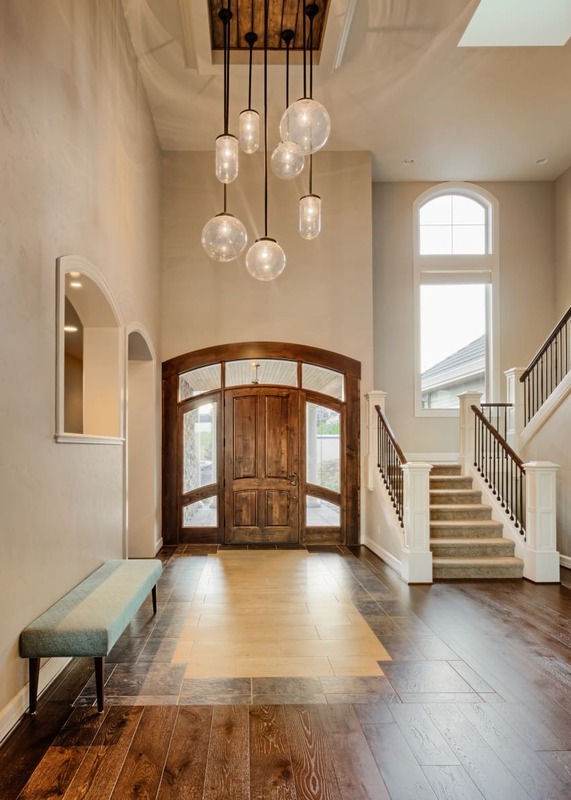 Foyers are mainly found in large homes and they are usually designed and decorated in an eclectic way because they are the front display of the whole house when someone enters the front door. This first impression when entering the house should be a good one, that’s why foyer’s décor should be carried out by a professional. 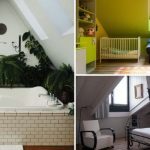 Nevertheless, even owners of small houses without a large entryway could benefit by looking at the design and decoration ideas of the images below. We are sure you will capture some nice styles and decoration elements to use on your own home, even if you only have a small entry hall. A foyer can also be utilized for incorporating some necessary entryway furniture such as storage for coats, bags, hats, shoes etc. A nice rug/carpet and a stylish table with décor accessories on it are usually accommodated here. Since the foyer is the entrance of the house, a staircase is usually placed in this space leading to the upper floors of the house. 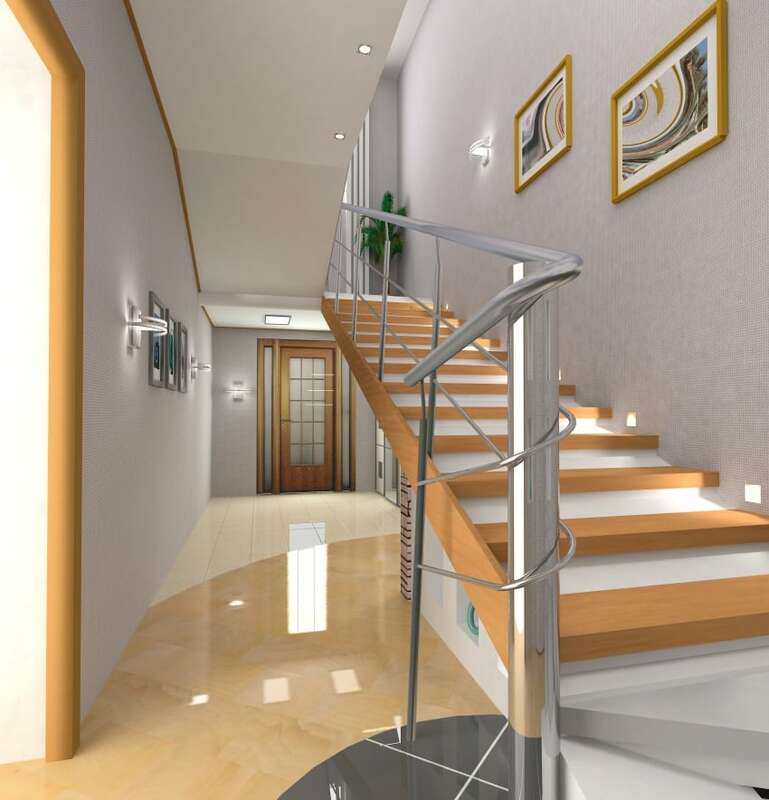 You will find some amazing staircase designs and much more in the images below. 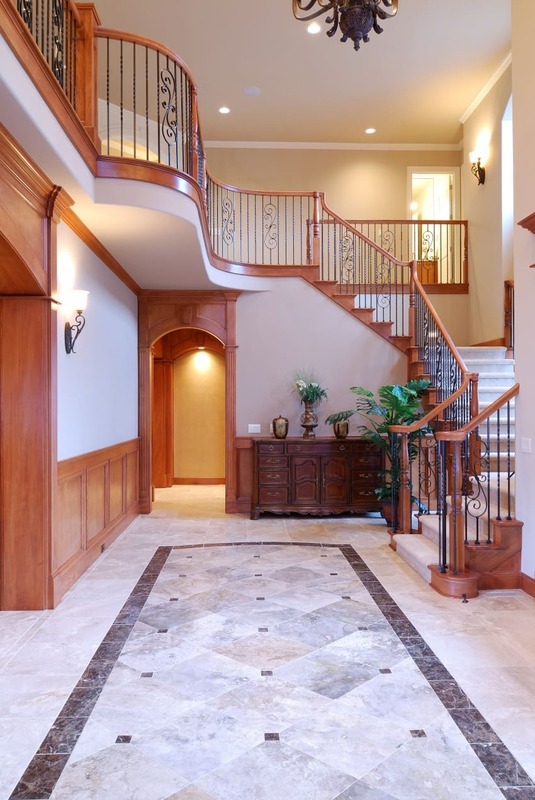 Moreover, go ahead and have a look at these foyers with staircases for more design ideas. A symmetric layout is guaranteed to inspire a sense of majesty. 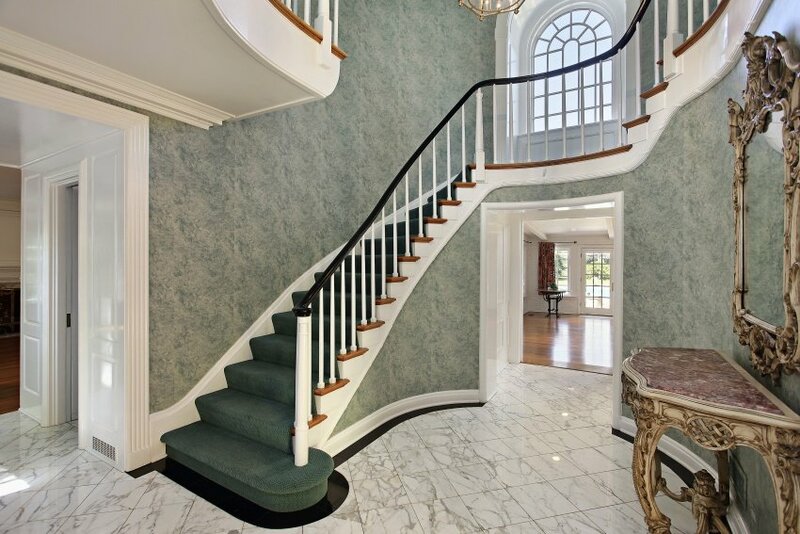 In this remarkable design, two curved stairs circle around an elegant foyer featuring polished floors, textured brickwork and elegant wainscoting. 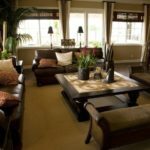 A proper choice of earth tones is what makes this setting warm and hospitable. 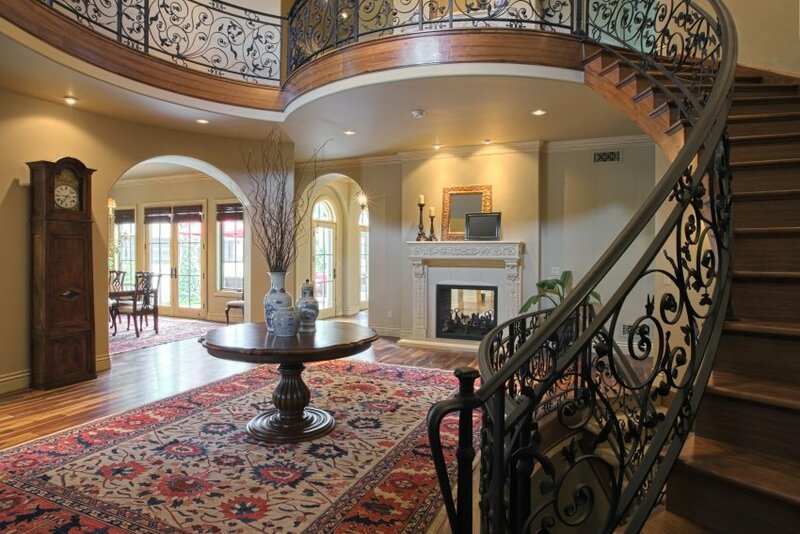 Circular lines and intricate details shape up this magnificent entrance hall. Decorative marble flooring draws your attention as your eyes survey the room. White wainscoting and olive green paint are chosen to cover the walls, and a beautiful chandelier hangs from the ceiling. 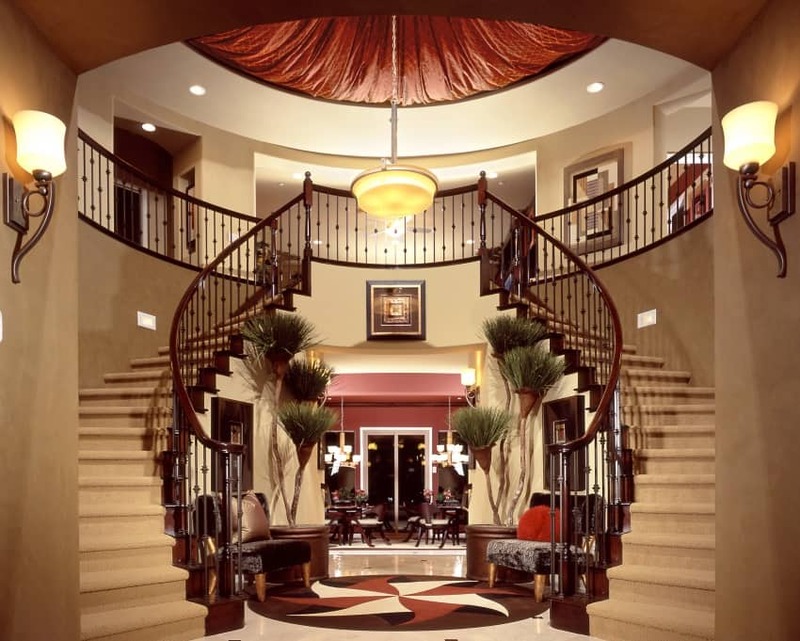 Here is another example of a majestic foyer with curved stairs. The circular floor pattern and decorative ceiling feature red accent colors that are matched with neutral beige and chocolate brown. A combination of sconces, spotlights and a chandelier ensures that the whole scene is well lit. 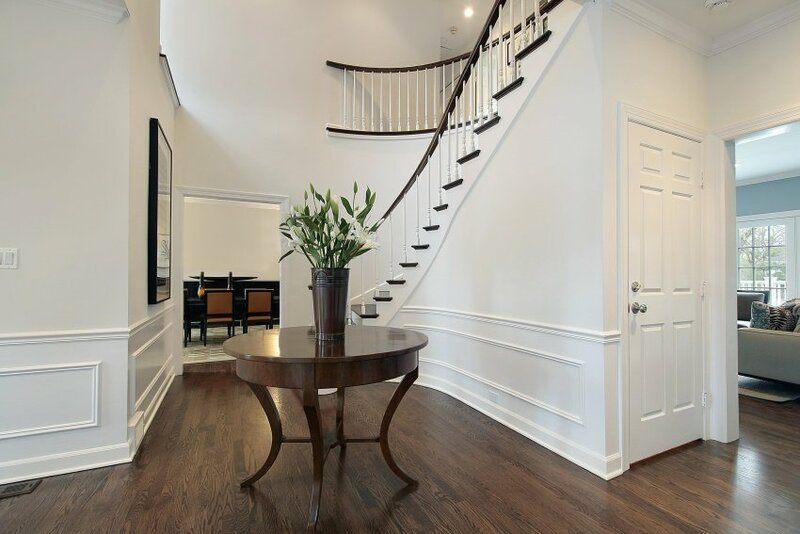 Enjoy a classic foyer design with dark hardwood floors, ivory wainscoting and wrought iron railings. Slanted ceilings close on a private little area that you can furnish any way you want – here it is turned into a nice music corner. This bright entrance hall with high ceilings and sleek floors is set in egg-shell and yellow tints. Wrought iron details in black add a little contrast and extra grandeur. A console table with a mirror and lighting is a simple and convenient way to furnish such a space. 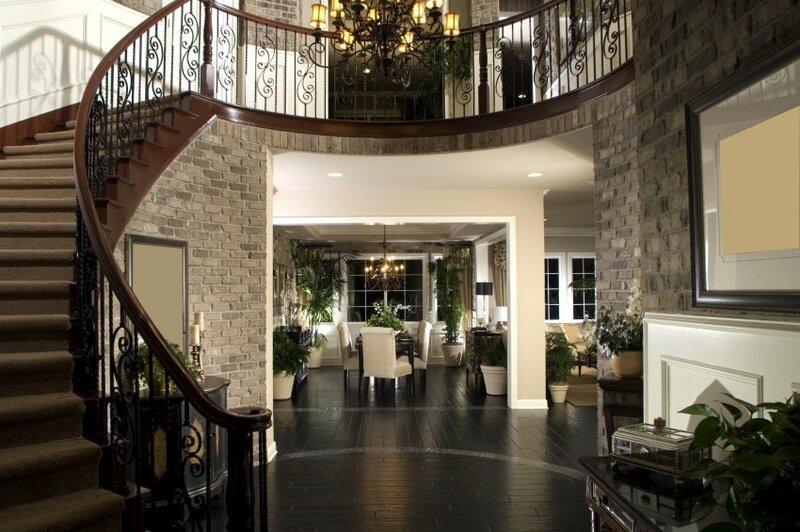 This foyer is set in dark shades to attain a more dramatic look. 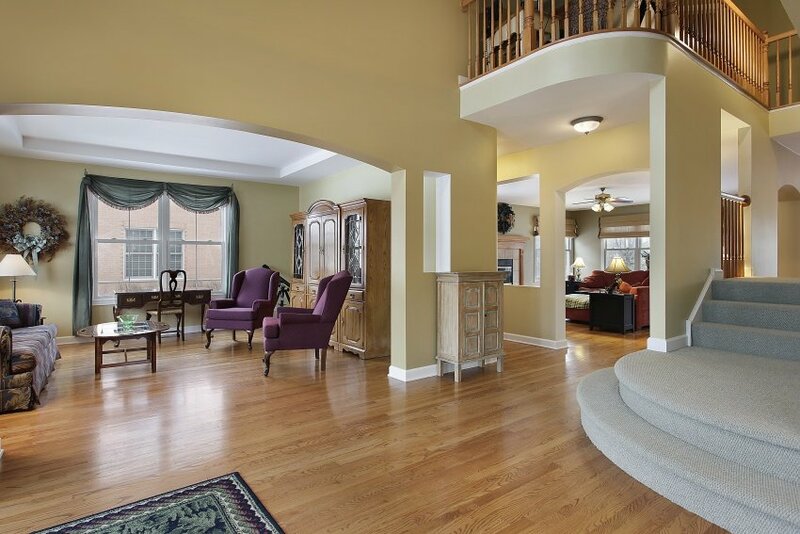 Hardwood floors, brick walls and wrought iron railings are guaranteed to wow your guests. To add the final touch, let a magnificent chandelier hang over and illuminate the area. 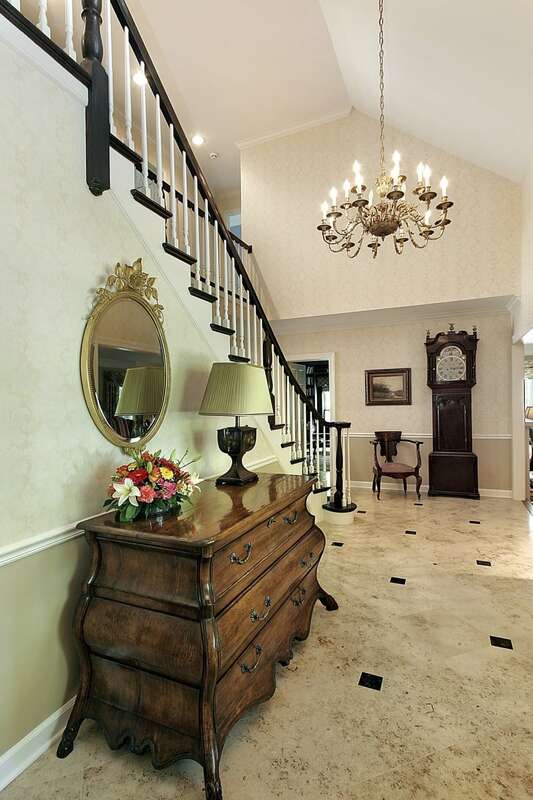 Here is an example of an entrance hall with a more humble appearance. It is simply furnished with a large table that can be beautifully decorated and turned into a magnificent centerpiece. This modern rustic foyer sure is nice and cozy. It is set in ochre and brown, with walls in decorative plaster, and floors in dark wood. 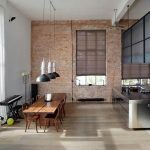 Large windows let the sunshine in and open a view to some beautiful surroundings. Wrought iron lighting fixtures are there to make sure that the room is properly illuminated at all times. Now this is some classy design with a rustic appeal. Gridded windows, wrought iron lighting fixtures and unconcealed beams are what makes this setting so magnetic and compelling. A seating corner, equipped with a nice soft rug, is particularly inviting. Modern simplicity is what best defines this design proposal. Neutral colors, glossy surfaces and wood details are in the mix to create a clean minimalist setting. There is no need for excessive ornamentation – functionality is of the utmost importance. 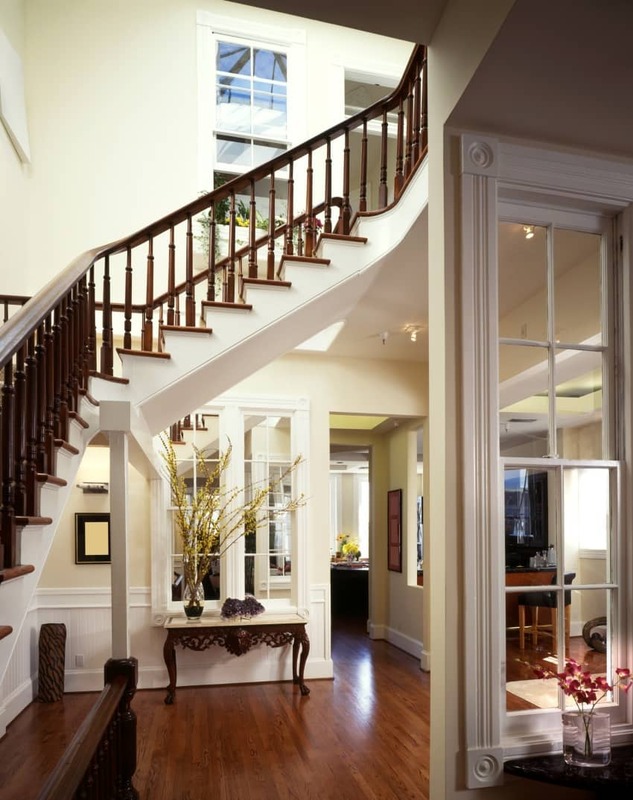 This charming little foyer features lots of interior windows that visually connect all rooms to one another. It is set in light colors with some dark wood details that catch the eye and establish a certain sense of comfort and warmth. 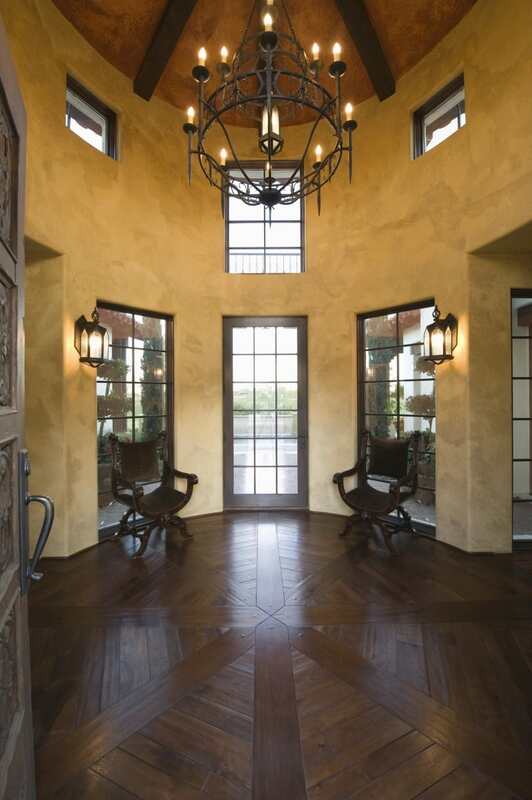 Patterned floors and ceilings strike you with their beauty, and add certain character to this entrance hall. It is also conveniently furnished with comfy seating and a console table, and is lush with house plants. Just fascinating. This classic design is set in the cool hues of the color palette. The floor is laid with marble tiles, and the walls are finished in decorative plaster. 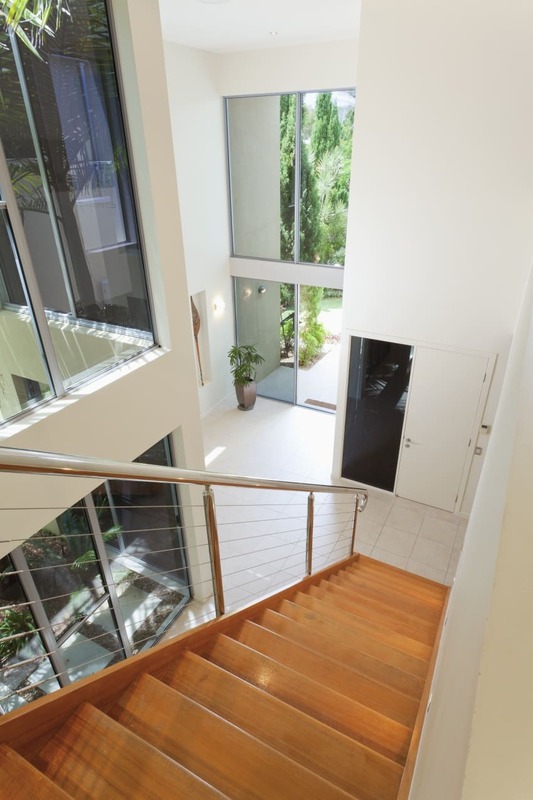 The stairs are carpeted in deep green and equipped with a timber railing. A color choice of grey is certain to deliver a sophisticated and intense design. Through the use of various shades, textures and patterns, you can be positive that your interior will never look dull. Be sure to generously decorate the space with plants and other accessories. Nothing inspires a sense of comfort as much as natural wood and soft carpeting. Be sure to lavishly use those materials to decorate a vestibule that will warmly welcome you into your nest. 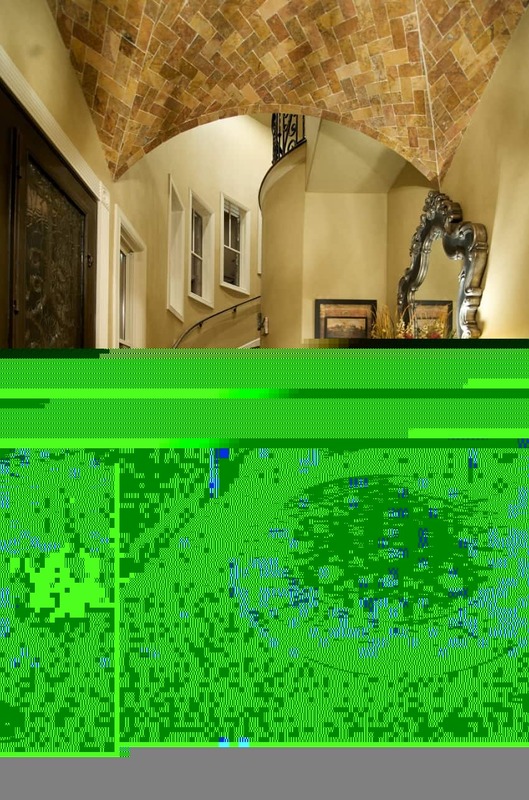 This exquisite entrance hall is bursting with light. The walls are clad with white panels, with gaps set in stainless steel, and the floors are laid with polished concrete that reflects the light. 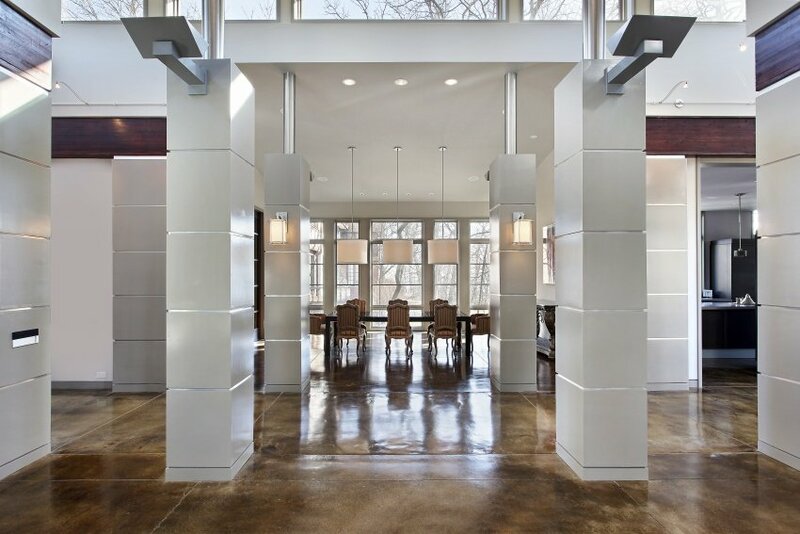 Modern clashes with classic, as the foyer opens up to a dining area, furnished with antique pieces. 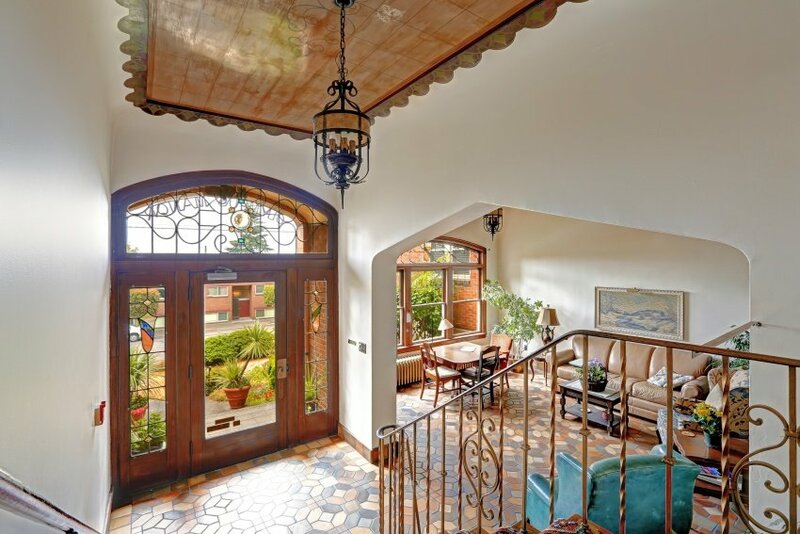 In this open concept home, the foyer merges with the other rooms through a series of arched portals. Dark wood is used to outline the openings and accentuate on their shape. 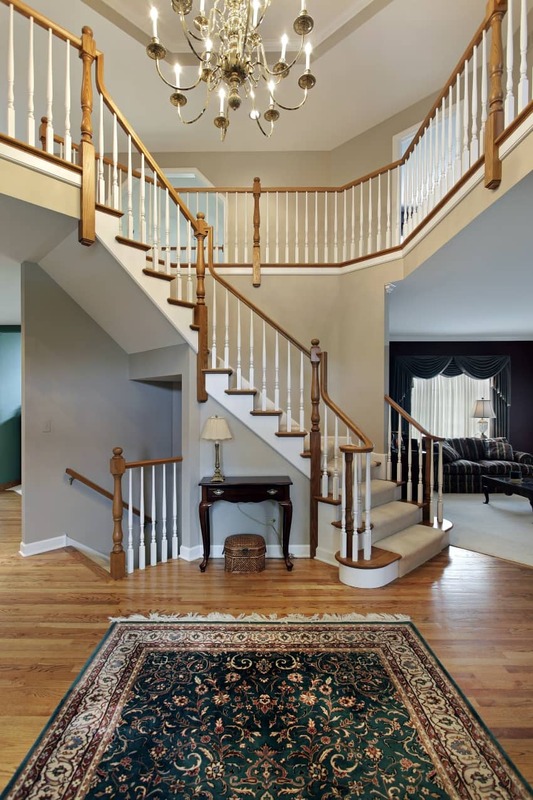 Soft carpeting is used to cover and protect the wooden stairs. White dominates the scene in this modern design. Glass is also a preferred material and lets in as much sunlight as possible. 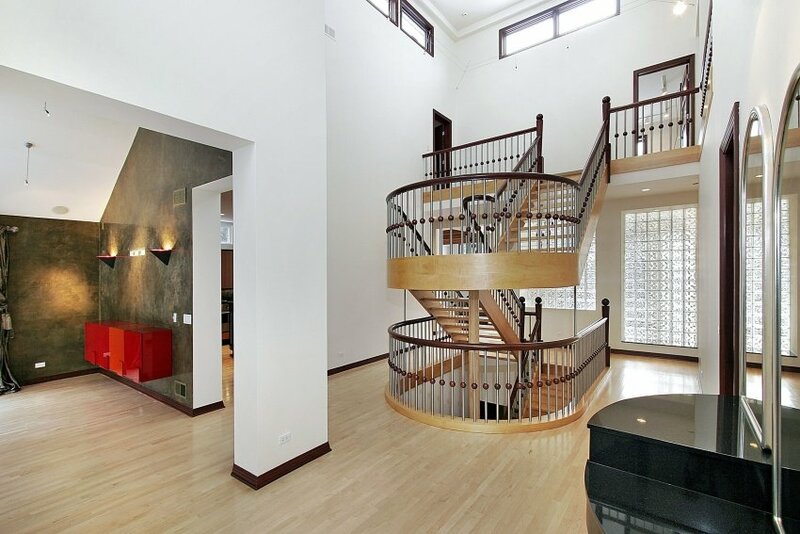 The wooden staircase is vivid in color and texture, and is equipped with a sleek stainless steel railing. The wow factor is strong with this one idea. 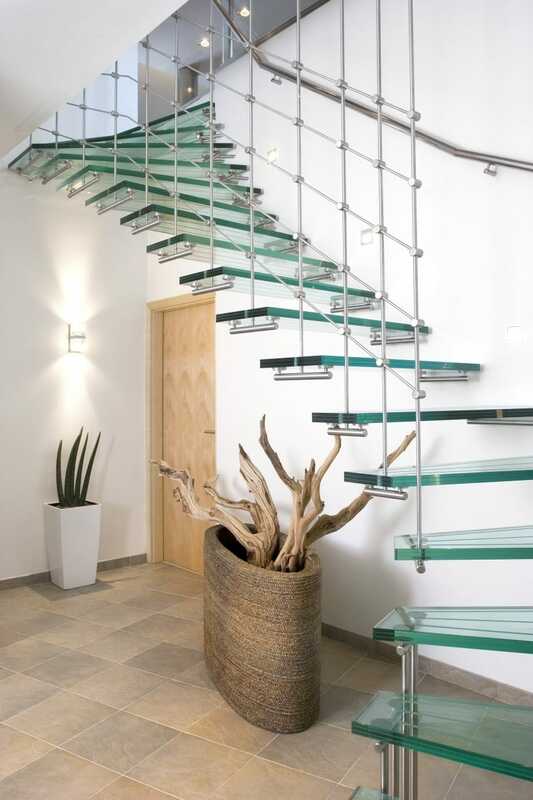 Suspended glass steps are an innovative way to design your foyer. Throw in a little stainless steel to go with it, and do not hold back on the white paint if you are trying to achieve a sleek modern look. This entrance hall design is pretty straightforward – set in shades of white and simply furnished. Coffered ceilings and wainscoted walls go beautifully together and so do hardwood floors and Persian carpets – pure excellence. Here is one more design in white. Walls, wainscoting and doors all blend in together. The white scenery is broken up by dark wood in the floors, stairs and railings. It is a beautiful idea to furnish your hallway with a round table featuring a large floral centerpiece. 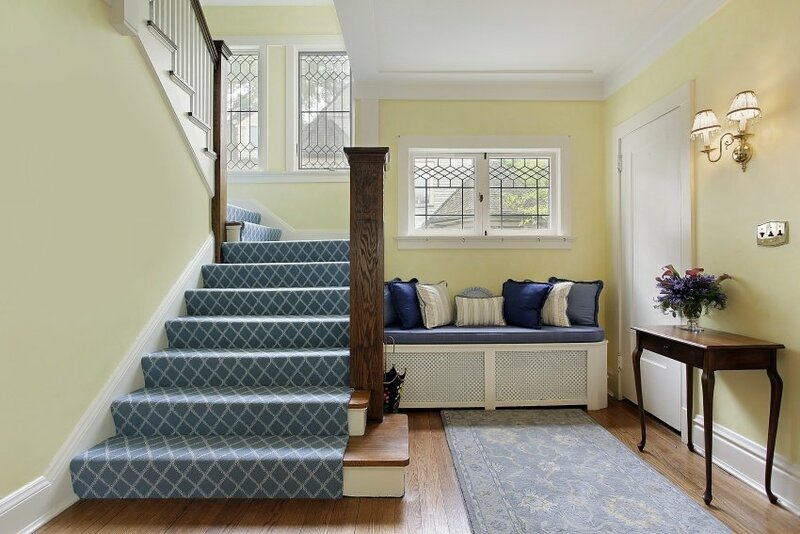 Yellow walls, hardwood floors and blue textile are in tune in this charming little hallway filled with light. A cushioned bench at the far end of the vestibule looks welcoming and comfortable. 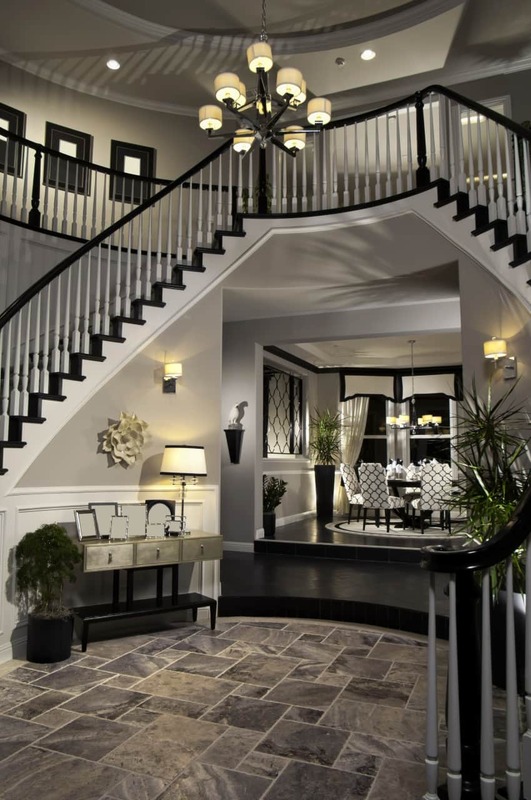 Enjoy a simple but elegant design of a rounded foyer. It features light grey walls and white ceilings that go great with beige ceramic tiles and dark wood. 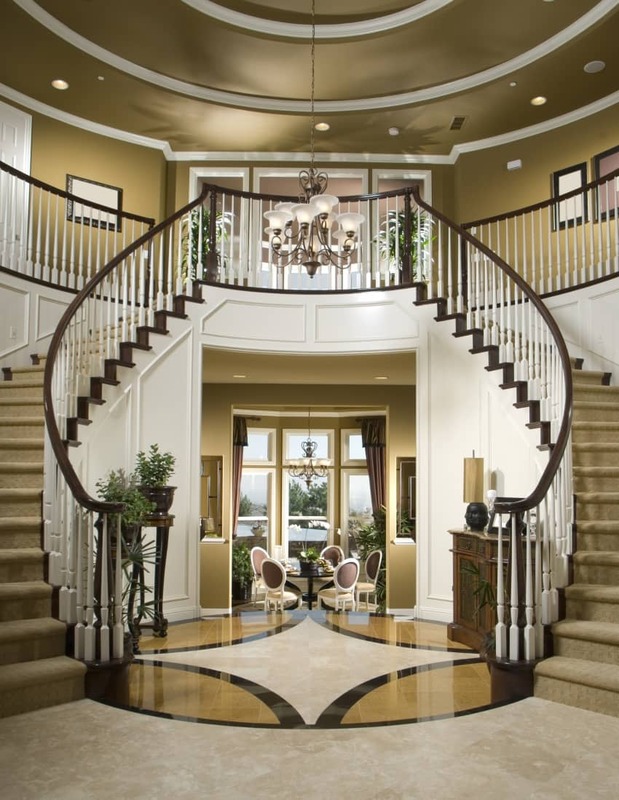 A curved staircase looks beautiful as it leads you to the upper floor. The U-shaped stair with a semicircular half-landing is the focal point in this modern hallway layout. The whole space is painted white with some accent walls in dark grey plaster, as for the floors, they are laid with white beech parquet. This rustic entrance hall welcomes you to a cozy home in white and wood. The floor is laid with terracotta tiles and covered with a classic carpet. Decorative accessories help personalize the space. 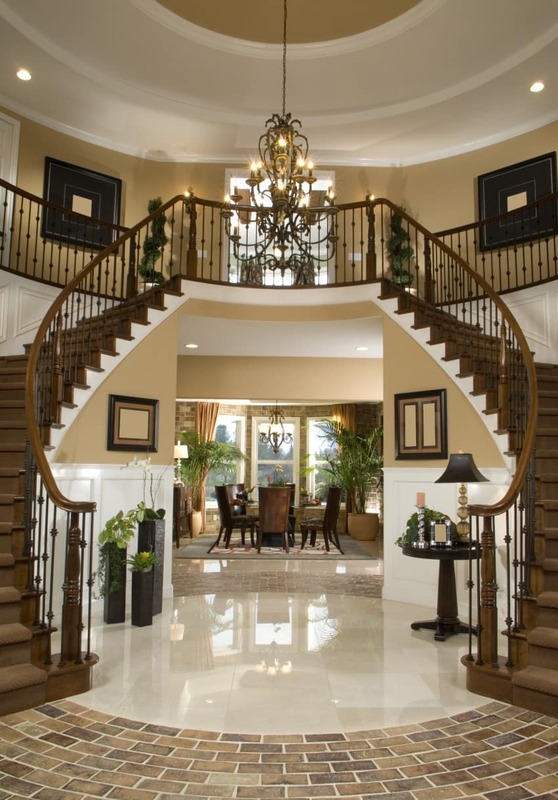 Here is a more traditional foyer design. Broad arches and smaller openings create an open concept house layout with a number of interconnecting spaces. 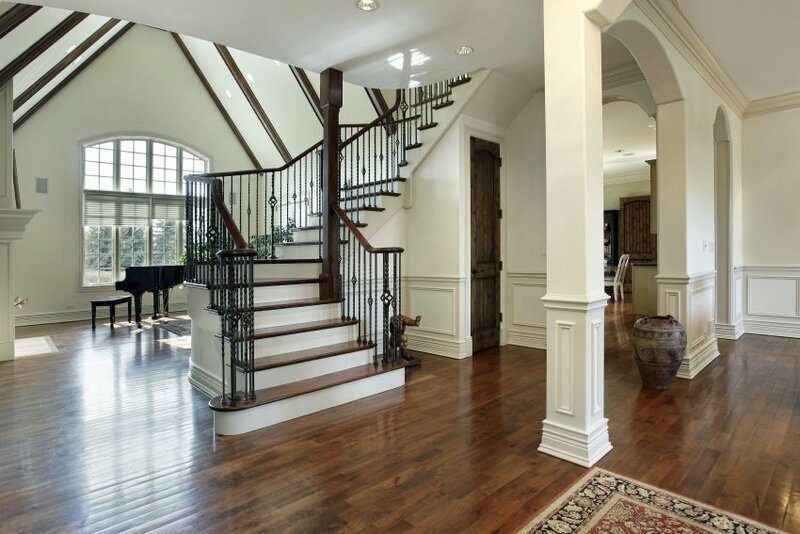 Neutral colors and hardwood floors are always a nice choice. 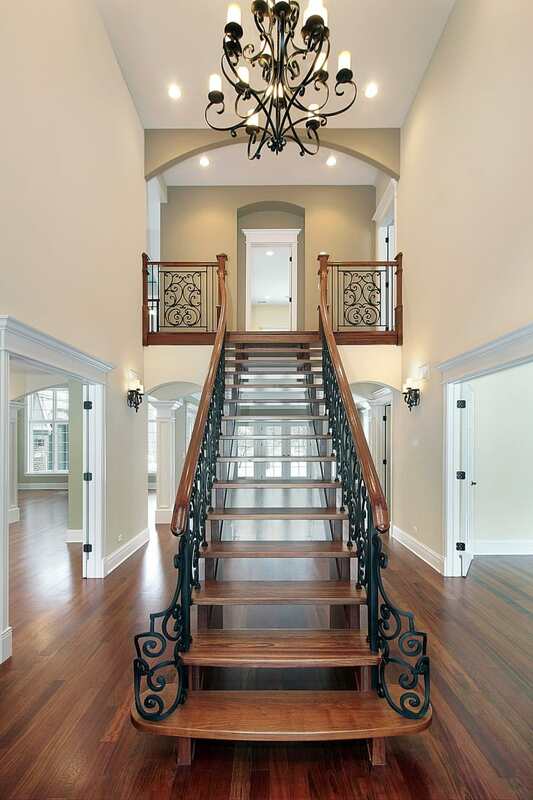 This open concept house has beautiful straight stairs with curved steps and wrought iron railings. The symmetric layout with arched openings and large portals on both sides of the staircase imposes an aristocratic feel. 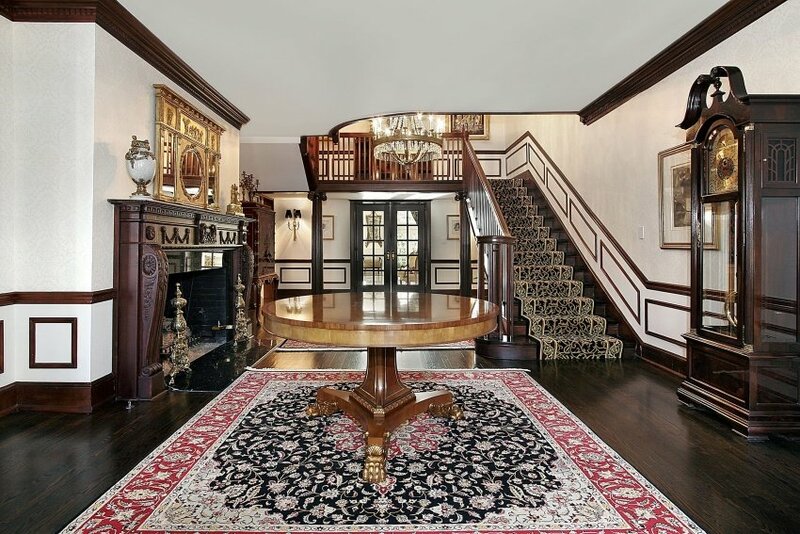 This excessively large foyer sure is impressive. It is set in washed out colors and dark wood to add some contrast. A classic styled round table with a decorative centerpiece is a nice way to utilize a portion of free space in the center of the room. 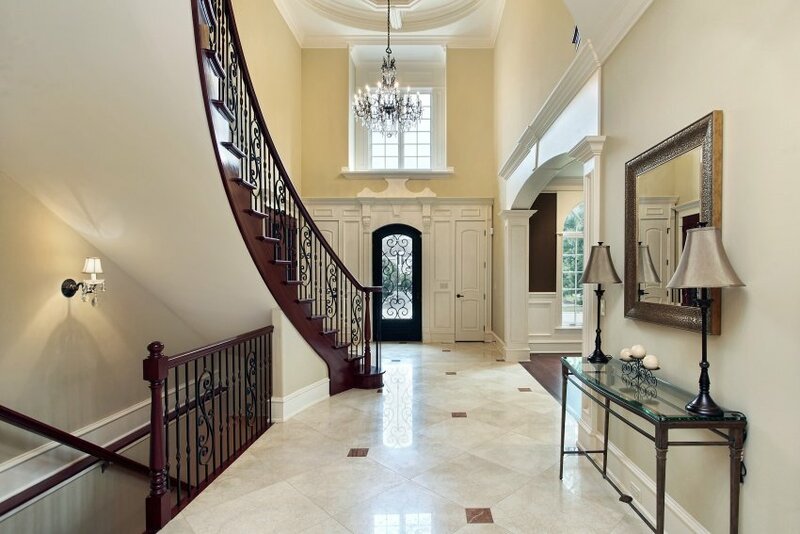 In this luxurious entrance hall you can witness a fine blend of shades of white. The floor is laid with glossy tiles that are both resistant to wear and easy to clean. The hall is nicely furnished with a couple of armchairs and an end table. Here is another example of a light-filled hallway in shades of white. The walls are finished in paint and wainscoting, and the floor is tiled and covered with carpets. Console tables are placed along the walls and decorated accordingly. Dark outlines, rich patterns and classic details really hit it off in this stunning proposal. There is no need for additional decoration here because the furniture itself is ornate enough as it is. This design idea speaks of class, luxury and comfort. Here is yet another traditional idea for hallway design. In this proposal you can rely on cherry wood to add some vivid colors to an overall neutral color scheme. Wrought iron railings never fail to deliver some intricate shapes and details. You do not usually come across a marvelous vaulted ceiling in your regular hallway. It most certainly will catch your eye and blow your mind. The brickwork is intriguing and goes well with other traditional materials such as hardwood and wrought iron. Classic design will never go out of style. Smooth lines and intricate details always are sophisticated and elegant. 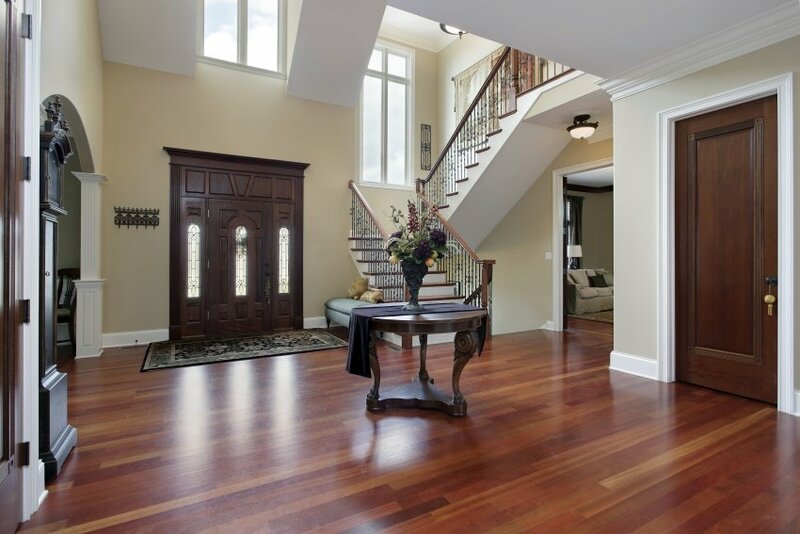 In this foyer you can find some beautiful furnishings that are sure to welcome you into a lovely home. 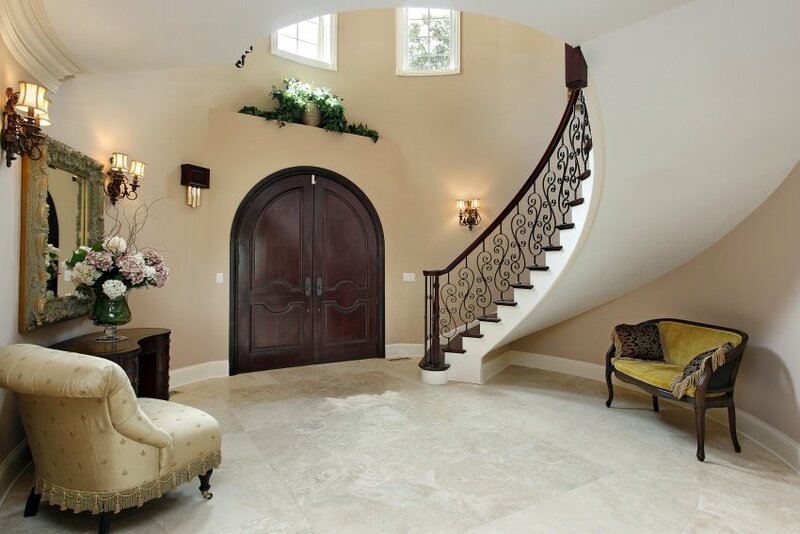 This circular entrance hall is cozy and sweet. Smooth lines are the main theme here, and you can find them anywhere – whether it is in the furnishings or as they run through the curved stairs. Even the door has a rounded top. 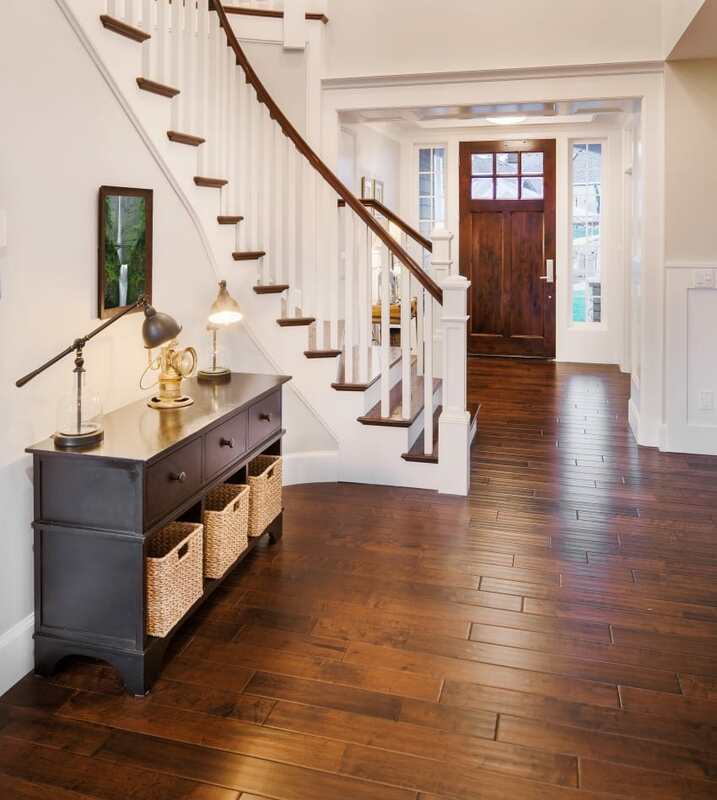 Hardwood meets wrought iron in this traditional hallway design. A round table sits on a Persian carpet in line with a large fireplace that greets you with a warm welcome as you enter. 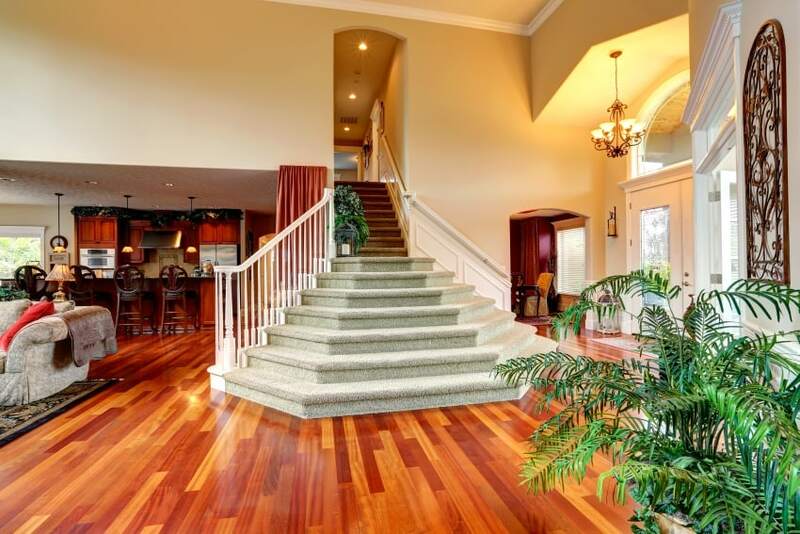 The floor in this foyer is laid with a beautiful combination of hardwood and ceramic tiles. The ceilings are not any less stunning, with an accent opening also done in wood. Various pendant lights drop down from the ceiling. Less is more in this humble design. You do not need more than some wood parquet to lay your floors, and a simple drawer chest is just enough to furnish your hallway. No excessive decorations are required. 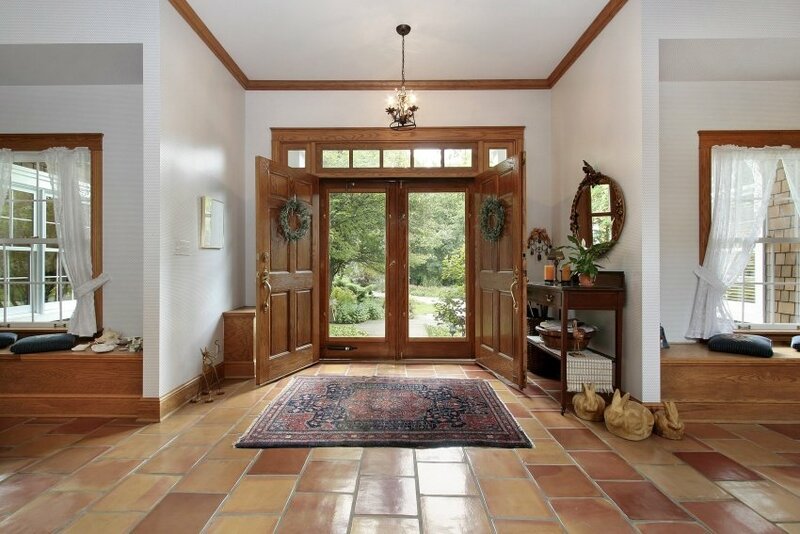 This rustic entrance hall is laid with terracotta tiles and overhung by a decorative ceiling. 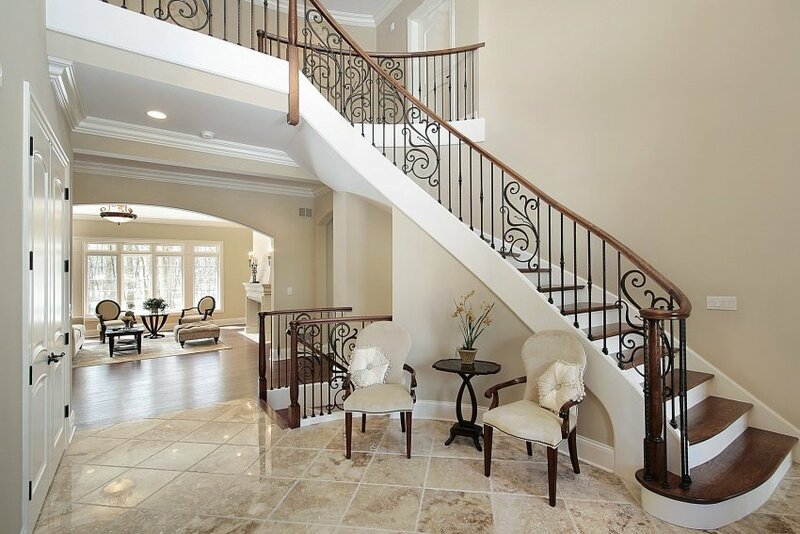 Wrought iron railings and lighting fixtures are an integral part of this design. The hallway opens up through a large portal to a cozy living room area. The entrance hall in this house is a part of a larger space that also includes living, dining and cooking areas. It is set in warm earthly tones and is laid with a vividly colored wooden floor.